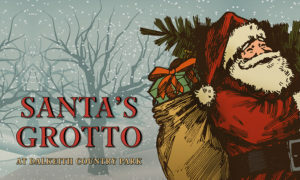 Santa and his elves are coming to Dalkeith Country Park to give your kids an unforgettably magical experience this Christmas. Making dreams come true, our Santa (and we are pretty sure he is the real one) wants to make sure every child he meets gets plenty of time with him so they can tell him their dearest wish, get a free photo opportunity with him and receive a proper under-the-tree worthy gift. As part of the package you’ll also get free entry into Fort Douglas on the same day. Sunday 2nd December, 10.30am – 4pm. Saturday 8th December, 10.30am – 4pm. Saturday 15th December, 10.30am – 4pm. Sunday 16th December, 10.30am – 4pm. Saturday 22nd December, 10.30am – 4pm. Sunday 23rd December, 10.30am – 4pm.